A few months ago, I was asked to be a part of the 2010 Green Books Campaign sponsored by Eco-Libris. This campaign is aiming to promote "green" books by reviewing 200 books printed on recycled paper or FSC-certified paper. By turning a spotlight on books printed using environmental paper, we want to raise the awareness of book buyers to this issue and encourage them to take it into consideration when purchasing books. 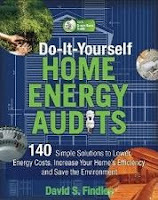 For this campaign, I chose to review the book Do-It-Yourself Home Energy Audits: 140 Simple Solutions to Lower Energy Costs, Increase Your Home's Efficiency, and Save the Environment. I figured it fit in well with this year's Freeze Yer Buns Challenge as well as the home energy audit contest I will be hosting at the end of the month as part of the challenge. This book shows you how to increase your home's energy efficiency by offering 140 energy saving solutions, most of which require little in the way of financial investment. The suggestions to improving your home energy efficiency are relatively easy to do and the vast majority of the suggestions were surprisingly cheap. And, all of them will save you money over the long term. It is written in a very conversational tone, which makes reading it straight through or a section at a time enjoyable. The author, an energy expert, comes across as a friend giving you advice, rather than a know-it-all telling you what to do. I found it to be an easy read and picked up some great advice, much of which I'll be trying to implement this winter. You can look forward to me sharing some of the things I learned from this book. Have you ever had a professional energy audit done on your house? Would you want one done? Or do you just try to learn as much as you can and do it yourself? If you want to participate in the Green Books campaign, make sure you check out the reviews of books on the campaign's list that look interesting to you. Interesting. Does the book actually say anything new, or is it sort of the same old stuff? We had a professional energy audit done last winter because the Feds were offering rebates for energy retrofitting, provided one had an energy audit done. We did almost everything they recommended and got a fair amount of money back. Definitely worth it. House much warmer now that air is not leaking in and out from every nook, cranny and window. We had an audit done about a year and a half ago as the Canadian government was offering gobs of rebates. We found out that we were losing 50%! of our heat through our basement (old house) ACK! Sure enough last winter with all of the improvements that were sugggested done we saved a tonne in heating costs. This was even with me at home during the coldest months with a newborn. I would have a professional audit done. But until I have the mega bucks to pay for everything they think that needs changing, I will muttle along as I do now. I would like to have a profesional energy audit done. I know we're losing energy and I'm pretty sure I know where. It's my husband that needs a little more convincing. I would love to have a home energy audit, but not on my house now. We put plastic up on the windows and our house is like a windsock. When our new passive solar house is done and super insulated I'd like to see how we did. We had an energy audit done after we bought our house last year. We were surprised by the findings which showed a lack of insulation (attic and walls)and gaps and cracks everywhere. Since the audit we have worked really hard to "tighten up" our house. My husband is now an expert caulker (and can and will speak at length about the different types of caulk for different projects), we fully insulated the attic and garage walls/ceiling, and replaced the 65 year old windows. The difference so far this fall is already outstanding. While we know we will not recoup the $$ spent (on windows especially) we have been able to dramatically turn down the temps and still be comfortable! It was totally worth it! !